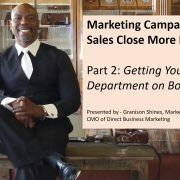 In this video, Granison Shines, talks about getting your sales department to buy in on your marketing campaigns. A simple, yet proven, process that he’s used in his corporate days to synergize the departments and to experience more success with marketing campaigns and sales efforts. To assist in constructing you USP we have created this “fill in the blank” formula. Direct Business Marketing is a marketing consulting firm for small to medium sized businesses who want to focus their marketing and generate more leads. We create and execute a marketing plans that is customized for each client to increase our client’s sales. whoever you serve do what? Need assistance with our USP? Get on my calendar and I’d be more than happy to help. Finding Focus with Your Marketing – Who are you REALLY selling to? Getting laser focused to figure out your exact target market is a process. You need a marketing plan and there are certain things that you should focus on. Typically people focus on demographics like age, income, location, employees, revenue, etc. However, a we have a better way to figure out your target market. Ask yourself, what do my potential clients actually want. From there, it’s much easier to find a campaign and a call to action that will convert for your business. When you start having discussions about what your potential client wants, your marketing ideas show themselves. Identify what your client actually WANTS and the rest falls into place. What problem does your organization solve? Answer that question and work backwards from there! 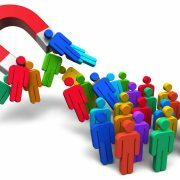 https://directbusinessmarketing.com/wp-content/uploads/2016/07/finding-focus-with-your-marketing-8211-who-are-you-really-selling-to.jpg 720 1280 Webmaster https://directbusinessmarketing.com/wp-content/uploads/2016/02/DBM-logo_horizontal_white_100x275.png Webmaster2016-07-19 12:30:102016-07-19 12:30:10Finding Focus with Your Marketing - Who are you REALLY selling to? Hello everyone Granison Shines here, chief marketing officer at Direct Business Marketing talking with you today about the copywriting. This blog is part of a series on copywriting so make sure to check out my previous blog as well in order to get the entire message. Understanding what copywriting is and how to execute it correctly can make a huge impact in the succcess of your marketing strategy. In this blog we will be discussing the call to action that is brought on through copywriting. Every single piece of marketing that you put out should involve some kind of call to action. This is very important to remember in order to develop and improve a successful marketing strategy. You want a specific action to be performed from your marketing and this should be mentioned or clearly spelled out at the beginning and end. This call to action should tell the viewer what to do next and also what they will receive by following your steps. This can be as simple as a free download of your product or entry to a seminar you are hosting but it needs to be made clear to every person that views it. When developing your marketing strategy make sure your offer is prepared and easily accessibly so that way there is no disconnect or confusion when a view follows through. By having this call to action in place you can better assess the results of your marketing campaign in order to make improvements in the future. This is also a great way to get returning clients or viewers to develop a habit of following through on your offers every time. Once again make sure to view the entire series put together on copywriting in order to better plan your next marketing strategy including a call to action. 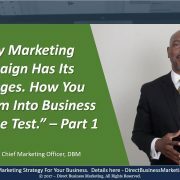 My call to action for you is to download our free marketing assessment planning document and questionare to learn where your marketing shortcomings may exist. Thank you for your time today and I look forward to hearing from you soon at Direct Business Marketing. Remember the easiest lead to convert is a client you already have… Take advantage of your current list and past clients and nurture them into referrals and new sales. As a marketing manager for a small business have you considered adding offline strategies into your marketing process? Although many marketing processes are internet-based these days, by adding an offline marketing process into your business’s campaign, it can help you get a physical document into consumer’s hands and help your brand get recognized. There are many different types of offline marketing avenues that you can choose to pursue; as a marketing manager, it’s important to know which ones will best fit the needs of both your business and your target market. Some of the more popular documents that small business marketing managers choose for their offline marketing campaigns are postcards, business cards, flyers and brochures. These are just a few of the ways to put a physical document into the hands of the public and get them to either check your business out in person, or online if you have a website. If you need a marketing firm to help you design, produce and print these offline documents, Direct Business Marketing can do that for you. Not only do they offer the previously mentioned offline services, they also can create letterheads, door hangers, envelopes and banners for your business. They have an in-house print shop that will create your documents for you while keeping them aligned with your online marketing processes. One last thing to keep in mind is that offline documents, such as business cards or brochures, can be a good tool to have when meeting with your customers face-to-face; you want to leave a lasting impression on them and provide them with a high-quality document is the way to do that. If you’ve spoken with other marketing managers in your industry, they’ll tell you that DBM is the company to go to for your printing services. We can help you update your marketing processes, reach out to more customers and make your job as a marketing manager much easier with our offline marketing services. Contact Direct Business Marketing today to learn more about how we can provide you with marketing process solutions for your marketing manager duties. Have you tried to use SEO and didn’t really see any results? Do you want to learn how to use SEO successfully and implement it into your business’s marketing process? If either of these situations applies to you, Direct Business Marketing has an SEO service to help you and your marketing process. If you want optimize your website for search engines, it’s first important that you understand the different ways to actually use SEO. The first technique is call on-page SEO and consists of actually placing keywords, video, title tags and relevant content on your website. When a consumer types any of the words or phrases you have on your website into a search engine, your website shows up in the results. The other technique for using SEO is off-page SEO. This technique mainly uses backlinks on such things as press releases or blogs that directs the customer to your website. One thing that you should know about working with DBM is that they will create large amounts of SEO items for your website, and show you how to use them correctly in order to get the best results. The strategies and techniques that we use are white hat, meaning they follow all of the terms and conditions outlined by the search engines. This ensures that your website won’t get banned or blocked, eliminating the purpose of learning how to SEO altogether. We have a variety of different SEO packages to fit the needs of your business; it typically takes about a month to see the results from your SEO campaign, so it’s important to be patient. You will see results as long as you stick to the SEO practices that we’ve taught you about. For more information on how DBM can help you increase traffic to your website and improve your business’s visibility, contact Direct Business Marketing today to learn how to successfully use SEO as part of your marketing process. Take a wild guess as to how many Real Estate Agents we engage with that DO NOT have a lead nurturing campaign!!! 3 outta 10 – Wrong! 6 outta 10 – Nope! How about 8 outta 10! Yep – you read it right, 8 out of 10 Real Estate Agents do not have a lead nurturing campaign for – their existing clients, existing leads, and new leads generated. Just imagine how much money you’re leaving on the table if this is you!!! Are you searching for a web solution that will not only provide you with current content on a regular basis but also improve your organic search results? If so, Direct Business Marketing has their Content Submission Service that you should consider adding to your marketing process. DBM’s Content Submission Service can help improve your online presence and your marketing process. So, what do you need to do to take advantage of this web solution? In order for you to take advantage of DBM’s Content Submission Service, all you need to do is submit your content to them. We’ll explain further; you can either record a video or audio file and submit it to Direct Business Marketing. We then turn it into text that is filled with keywords and post it to your website along with the video that you created. When we do this, we add a title, tags and an SEO friendly URL in order to get it the best search engine ranking possible. We also submit it to a number of different search engines to generate the most traffic to your site possible and to get you the best results possible for your web solution. While our Content Submission Service may not seem a viable web solution, that’s hardly the case; once more content gets submitted, your rankings will improve over time because more of your pages are being indexed by search engines. When you use this service as a web solution for your business, it shows search engines that your website has relevant and current content, boosting your website to the top of the search engine’s rankings. You always have access to the data and statistics regarding your web solutions so you know what keywords and web pages are being viewed the most often, as well as other results from your campaign. When you add a web solution such as Content Submission to your marketing process, it allows you the time to work on other aspects of your business because Direct Business Marketing is taking care of everything for you. Contact us today for more information on how we can help your online presence through our web solutions. How Can Marketing eCommerce Help Your Small Business? If you’ve thought about marketing eCommerce for your small business, you may have wondered exactly what the positive impacts are. If you talk to any marketing professional, they’ll tell you that eCommerce is a trend that has really taken off in recent years. Every year for the past few years, eCommerce sales have increased by more than 10%, making it a very appealing marketing process for small business owners to tap into. When you market eCommerce on your website, it allows you to increase the number of customers that you target because an eCommerce website can be viewed and used by consumers around the world. If a consumer isn’t interested in your business or products, this also saves you from having wasted your time, money and efforts on them. Basically, an eCommerce website helps you manage your marketing processes more effectively by helping reach only those consumers you wish to target. Lastly, when you market eCommerce on your website, it allows you to have an entire product and service catalog out there for consumers to view; you don’t have to pick and choose which products you want to showcase on your website. If you’d like help starting an eCommerce website, or if you have an existing website that you would just like to add eCommerce to, Direct Business Marketing can provide you with the eCommerce services that you are looking for. They offer a few different comprehensive packages to meet the needs of your small business. When you work with DBM, they can provide you with an eCommerce website built with white hat SEO techniques and ensure its secured via SSL. 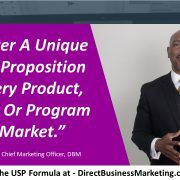 To find out more information about the professional services that Direct Business Marketing has to offer your small business, visit their website at https://directbusinessmarketing.com or give them a call today. https://directbusinessmarketing.com/wp-content/uploads/2016/02/DBM-logo_horizontal_white_100x275.png 0 0 Webmaster https://directbusinessmarketing.com/wp-content/uploads/2016/02/DBM-logo_horizontal_white_100x275.png Webmaster2013-07-17 10:19:372013-07-17 10:19:37How Can Marketing eCommerce Help Your Small Business?